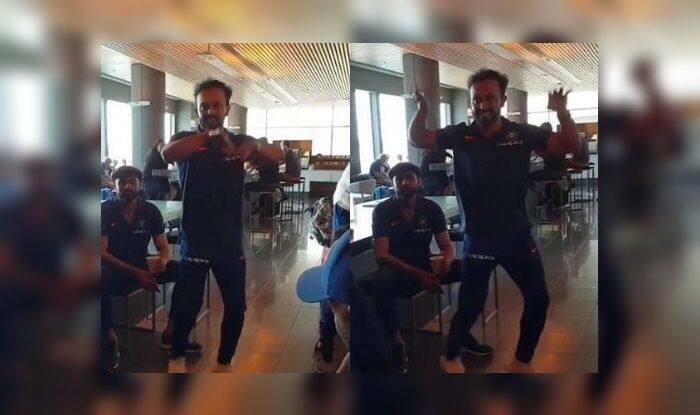 India vs Australia 2019 2nd ODI Adelaide: India allrounder Kedar Jadhav was spotted showing off his moves at the airport while the team was getting ready to leave for Adelaide for the 2nd ODI. India vs Australia 2019 2nd ODI Adelaide: India allrounder Kedar Jadhav was spotted showing off his moves at the airport while the team was getting ready to leave for Adelaide for the 2nd ODI. Jadhav, who is a Salman Khan fan was not shy as he broke into an impromptu dance which was lauded by his teammates. Jadhav’s moves left Rohit Sharma in splits as he could not control his laughter. Jadhav was not a part of the XI at Sydney, but he would be hoping he gets his chance and makes it count. Meanwhile, India did not get off to the best of starts in the three-match ODI series as they were beaten by 34 runs at SCG. Rohit Sharma was the top-scorer for the team as he scored 133 but that went in vain as he did not get adequate support from the other end. Chasing 289, India got off to a dreadful start as they were reduced to four for three within the first five overs. Shikhar Dhawan and Ambati Rayudu registered ducks which did not help. Then it was Dhoni and Rohit who stitched a 136-run stand to get India’s chase back on track but it seemed Dhoni had consumed a lot of deliveries which eventually made the difference. Meanwhile, U-19 World Cup star Shubman Gill and all-rounder Vija Shankar have been named as the replacement of KL Rahul and Hardik Pandya for the remaining ODI series against Australia and the upcoming tour of New Zealand. On Friday evening, the Supreme Court-appointed Committee of Administrators (CoA) suspended both the players, Hardik, and KL Rahul until further notice and has been sent home from the Australian tour. The Men in Blue would be hoping to bounce back at Adelaide and square the series 1-1. The second ODI at Adelaide is on January 15.